Once you select a shield, how do you determine its shielding effectiveness? Part 4 of this four-part series looks at how to compute shielding effectiveness, and why shielding effectiveness is a subjective indicator of shield performance. Shielding effectiveness (SE) is a term that is thrown around without much thought as to what it means. Most engineers assume that SE is an intrinsic shield property, but as we learned in part 3 of this series, shielding effectiveness is dependent on shield configuration and circuit impedances. It also depends on the nature of the interference to which the shield is exposed. Usually, we think of cable shields as a way to control radiation between cable conductors and the environment, i.e. radiated emissions and radiated susceptibility. However, shields can also be beneficial for controlling radio frequency current and voltage that flows on the cable conductors, i.e. conducted emissions and conducted susceptibility. Be careful though, shields sometimes create unexpected problems. As we illustrated in the examples below up-front analysis illuminates potential problem areas. Here we use the simple circuit below to determine shielding effectiveness. The circuit consists of a 5V source with a 1 Ω series impedance and a 10 kΩ resistive load. A 3.3-meter long wire, 5 cm above a ground plane, connects the load to the source. The shield is constructed of woven wire braid, typical of signal cables, and is terminated to the ground plane at both ends with negligible impedance. As discussed in the previous three parts of this series, cable SE is not a property of the shield, but instead is a byproduct of the shield construction, circuit impedance, and usage. Shield performance changes if any one of these changes. As we saw in part 3, shield transfer impedance and transfer admittance are the only intrinsic properties of a shield. If the physical dimensions of the shield, materials, or fabrication vary, SE changes. For a given cable shield, if the source impedance or the load impedance change, SE of the shield changes. That is why you cannot rely on manufacturer shielding effectiveness values. 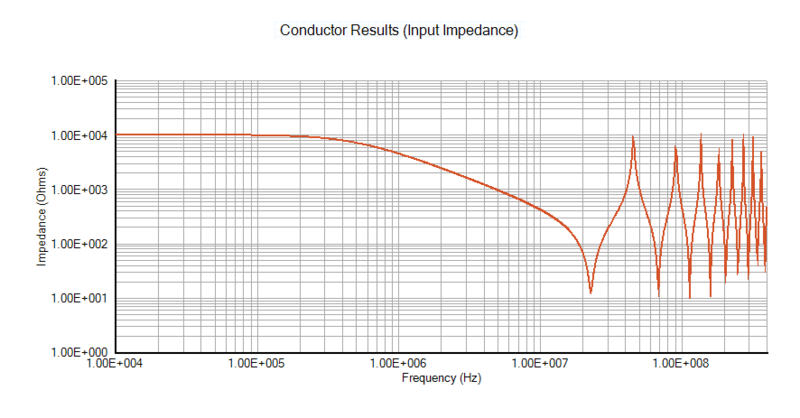 If your circuit does not have 50 Ω source and load impedances, SE will be different than advertised. SE is dependent on what the shield is doing. For example, a shield that provides 80 dB reduction in fields emitted from a cable, may provide only 40 dB attenuation for externally generated fields. The examples below illustrate how differently one shield performs when used for two different purposes. In the first case, we calculate SE for a conducted emissions application. In the second, we calculate SE for conducted susceptibility. The same shield provides radically different SE for these two uses. For this conducted emissions (CE) analysis, the voltage source is set to be a 10 kHz trapezoid with 100 nsec rise and fall times. 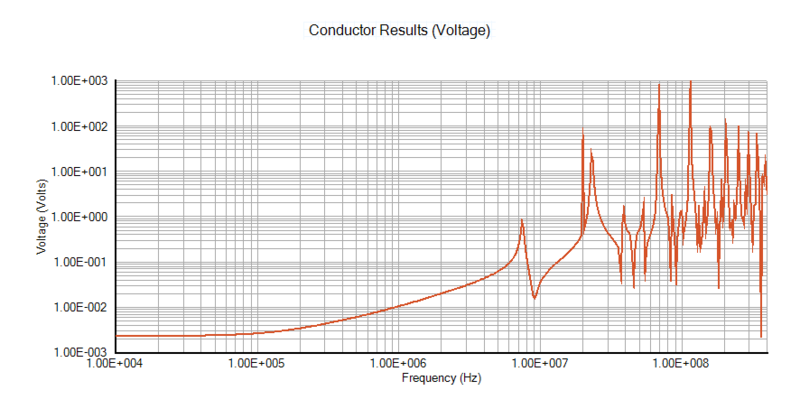 Conducted emissions is the frequency domain current induced on the wire by the source voltage. Using the circuit described above, we calculate conducted emissions without and with the shield and use the ratio of the results to compute SE. For the unshielded cable, source current has only one return path, the ground plane. For the shielded cable, source current has two return paths, the ground plane, and the shield because the shield is grounded at both ends. Since the ground plane and shield are in parallel, return current has a lower impedance path for the shielded cable than for the unshielded cable. As a result, conducted emissions are higher overall for the shielded cable than for the unshielded cable. 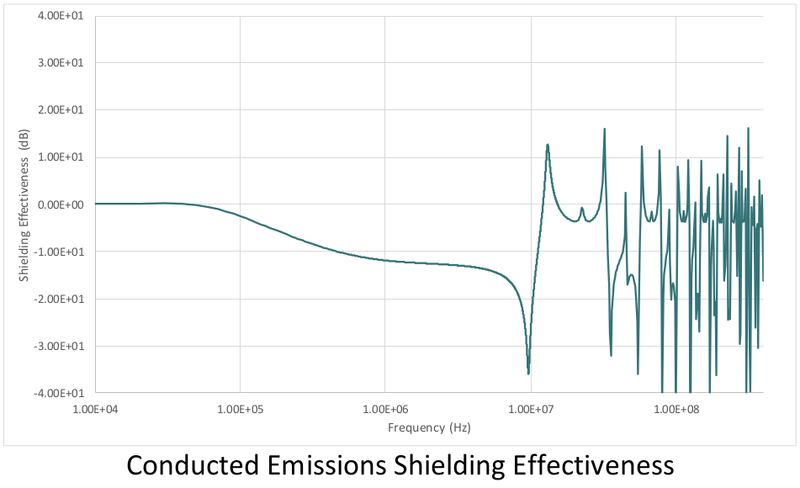 In this application, the shield makes low frequency conducted emissions worse, not better. Shielding effectiveness is negative below about 12 MHz. 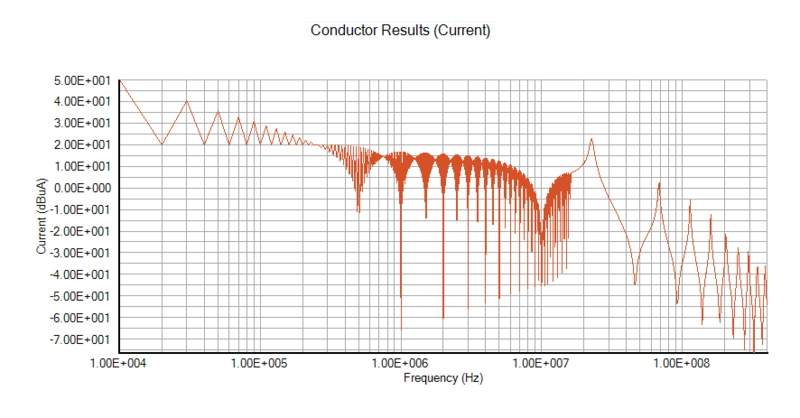 Above 12 MHz, SE alternates between positive and negative values due to cable and shield resonances. The answer lies in the cable input impedance. The capacitance between the wire and the shield reduces the input impedance of the shielded cable as frequency increases. 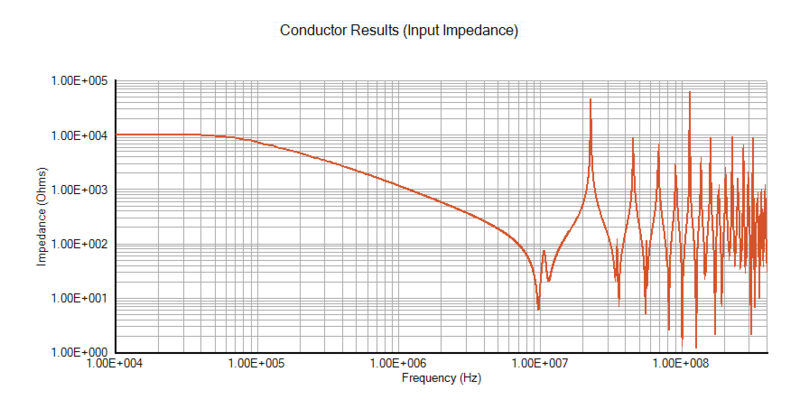 At 1 MHz the input impedance of the unshielded cable is 4.5 kΩ, but for the shielded cable it is just 1.2 kΩ. The voltage source, which has low impedance, produces greater current (conducted emissions) because the effective load impedance is lower for the shielded cable. 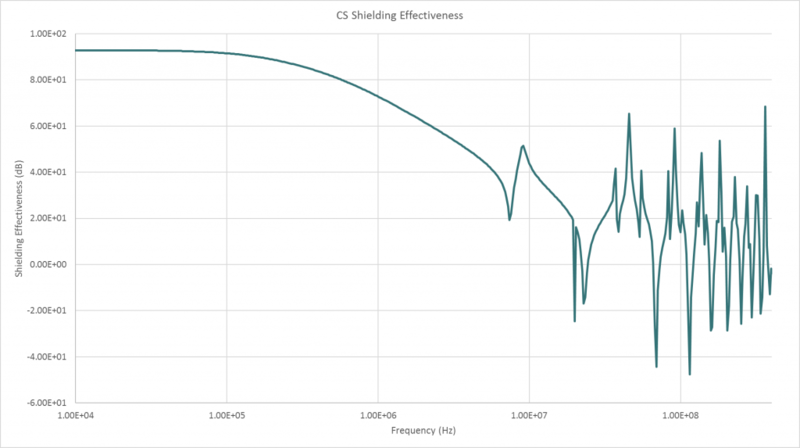 Now let’s look at the shielding effectiveness of the same cable shield for conducted susceptibility (CS) protection. A 10 mA sine wave is injected at the source end of the line, as would be done for bulk cable injection, and the frequency is swept from 10 kHz to 400 MHz. The induced voltage is monitored across the load impedance as a measure of how well the shield protects the circuit. 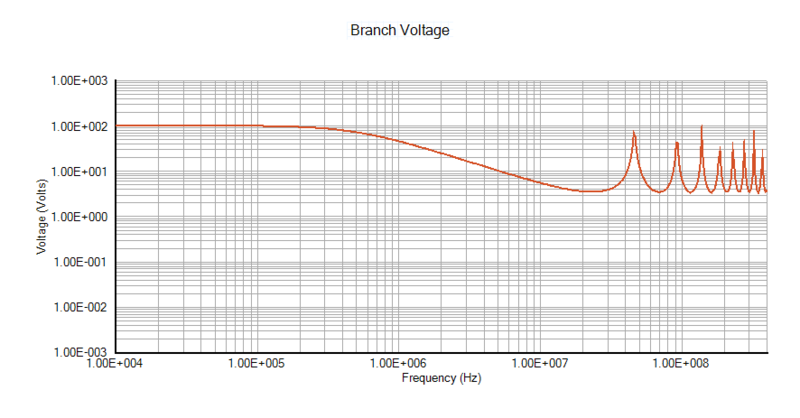 Current injected on the unshielded cable induces 10 mA on the wire. At low frequencies most of the injected current flows through the load, inducing about 100 volts. As frequency increases, some of the injected current does not make it to the load, due to radiated coupling effects, so the induced load voltage is lower at high frequencies. For the shielded cable, most of the low frequency injected current flows on the shield and minimal current flows on the wire, so low frequency voltage induced across the load is small. However, as frequency increases and the shield becomes less effective due to increasing shield transfer impedance, induced load voltage increases. Peaks and troughs in the induced load voltage are the results of complex resonances between the wire, shield, and ground plane. 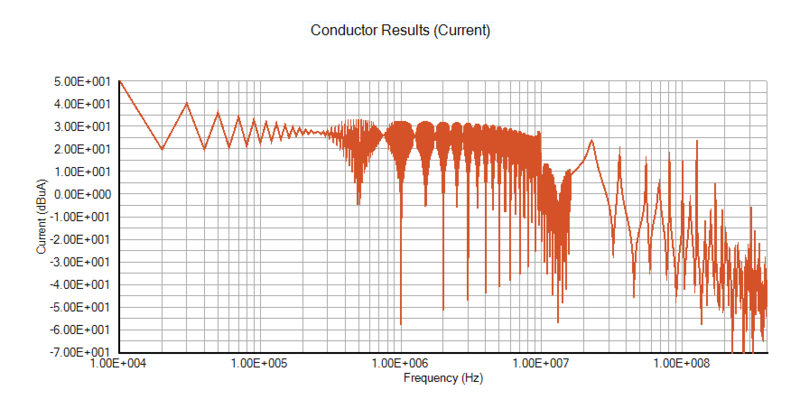 For this conducted susceptibility example, the shield provides more than 90 dB SE at low frequencies. 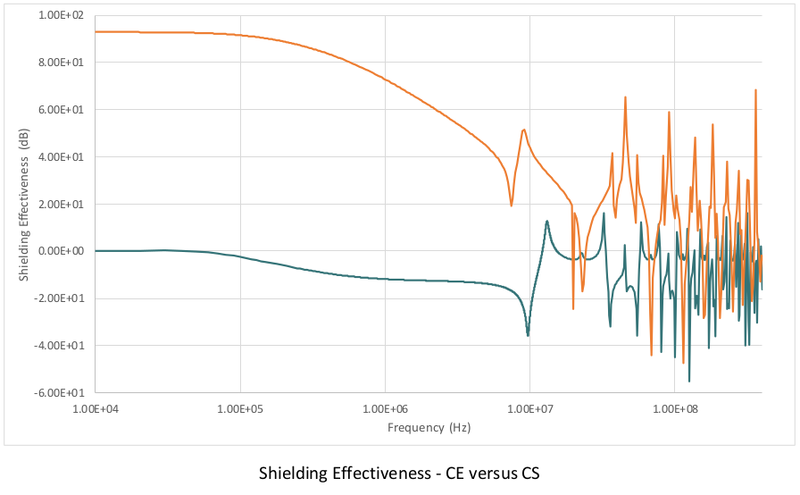 In contrast to CE shielding effectiveness, the CS shielding effectiveness of the shield is much higher over most of the frequency range. Same shield, different shielding effectiveness. Shielding effectiveness depends on usage. This article is the fourth of a four-part series that looks at cable shielding for electromagnetic compatibility. Please visit the EMI Software website to access the other three parts. Part 2 – How Much Shielding Do You Need?